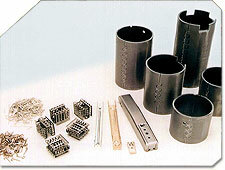 Team Manufacturing (www.teammfg.com) is a leading precision metal stampings and fabrication company with 43 years of manufacturing experience in the Los Angeles area. Ed Ellis, the president and general manager earned his bachelor's of science degree in engineering at UCLA. He founded Team Manufacturing with James Cheatham and Charles Naman in 1975. Cheatham is the company's vice president of engineering, where he and Ellis focus on partnering with its suppliers and a talented workforce to create teams that meet customers' needs. "Our vision was to start a precision metal stamping and fabrication company with a personal touch that would work hand in hand with suppliers and customers, creating a team-like atmosphere. Today that vision is still the foundation of our continuing success," said Ed Ellis and Jim Cheatham on the company website. Team Manufacturing stamps small precision parts from material down to 0.010 inch, and parts on a 500-ton-press from material up to a quarter inch thick. "We can satisfy a variety of needs," Team Manufacturing said on its website. "When you consider our robotic welding, vinyl plastic dip, CNC and secondary assembly capabilities, it's easy to see why Team is your best choice for producing turnkey products." Team Manufacturer produces heavy metal stampings daily that form motor shells on its 500-ton press. 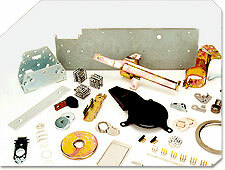 "Let Team's assembly capabilities reduce the number of part numbers in your inventory. Our light machining, drilling, tapping, robotic welding and mechanical assembly capabilities add value and help reduce your cost," Team Manufacturing said. "Our abilities to hold to tight tolerances in precision stampings, and meet exacting customer requirements are just some of the reasons why we're in demand in the gaming, telecommunications, electrical and automotive industries." To insure high quality parts, Team Manufacturing is not only ISO 9001 certified, it uses an integrated quality system on the manufacturing floor, it offers full traceability of all materials, and statistical process control to drive down process variation. It also offers a production process approval process upon request and detailed control plans to guide the quality and manufacturing processes. Team Manufacturing makes parts in aluminum, brass, bronze, copper and stainless steel, low and high carbon steel for automotive, appliance, furniture and gaming industries. "We can manufacture single hit, compound or complex progressive dies to your specifications," Team Manufacturing said, "or modify an existing die to meet new requirements. You make the choice–we deliver."